The end of summer is one of my favorite times of year! We have been busy trying to fit in all of the fun things we had talked about doing this summer. One of those fun things was having a bonfire at Grandma and Grandpa Distad's house. Here is Charlotte enjoying a s'more! Grandma and Grandpa's dogs were hopeful, but Charlotte was not going to share the deliciousness of a s'more. Charlotte enjoyed being goofy with Grandma and Grandpa even more than eating s'mores! She got 4-wheeler ride with Grandpa, and I think she liked it even more than last summer. She asked for a longer ride and was all smiles. The end of summer would be sad, if not for the Minnesota State Fair! This was Charlotte's third year at the fair and it gets better every year. She took her first ride down the Giant Slide with Daddy. Rode some rides. Check out that relaxed pose - just ridin' in a whale, chillin', no big deal. We rode the carousel! She picked the pink horse and had a blast. I felt motion sick and most enjoyed the ride when it wasn't moving (it was still fun being with Charlotte). I have no idea when this photo was taken, but it was somewhere on the fairgrounds and it makes me laugh. Charlotte met Champ! We were surprised to learn that it was UMD day at the fair. As alum we both got a carabiner with a compass - Charlotte likes them very much. She looks like she wants to get away from Champ in the photo above, but she was actually excited for this photo. It happened very quickly so she might have been a bit overwhelmed. Goldy is still her favorite! Today we got to celebrate Charlotte's cousin, Molly's, 1st birthday. She'll turn 1 on Monday and is already walking like a pro. I neglected to bring my camera, so I don't have any photos to share but it was a fun afternoon. Next up on our family adventure agenda: The Great Pumpkin Harvest at Grandma and Grandpa's House! It is my pleasure to write a blog post this evening as I have the good fortune to be conscious and healthy, both of which could not be said of my state 4 years ago, at about this same time, when Charlotte was being delivered via emergency c-section. I could lament how quickly the time has gone and how fast Charlotte is growing, but I would rather share author Sherman Alexie's words: I miss who she was, I love who she is, and I look forward to seeing who she becomes. Happy Birthday Charlotte. We began Charlotte's special day in the kitchen making pancakes and of course had to let her practice her fire extinguishing skills on a single candle. One marker of how much she has grown this year is that today is probably the first time that she was able to measure ingredients and pour them into the bowl without significant help. Let the record show that the Mickey Mouse pancake on her plate is the best one I have made yet. She has been requesting a mickey pancake anytime we have pancakes over the past 9ish months, and generally it ends up with one ear - today it turned out perfectly! Charlotte jumped right in to her birthday gift this morning. Although Charlotte loves having her own yard, she has clearly missed sharing a sandbox with our past neighbors (as demonstrated by her relentless digging up of the yard). So, a sandbox was a clear gift. This great sandbox was made by a local craftsman in Farmington. Here she was excited about being barefoot in the sand, which she insisted I try out after taking this picture. It was pretty fabulous. Charlotte was ready for some action when the party started this afternoon. Her very receptive aunt and uncle swing the jump rope for her while she asks them to slow down. Eventually it was decided that "snake" was the better jump rope game. She blew out the candles like a pro! 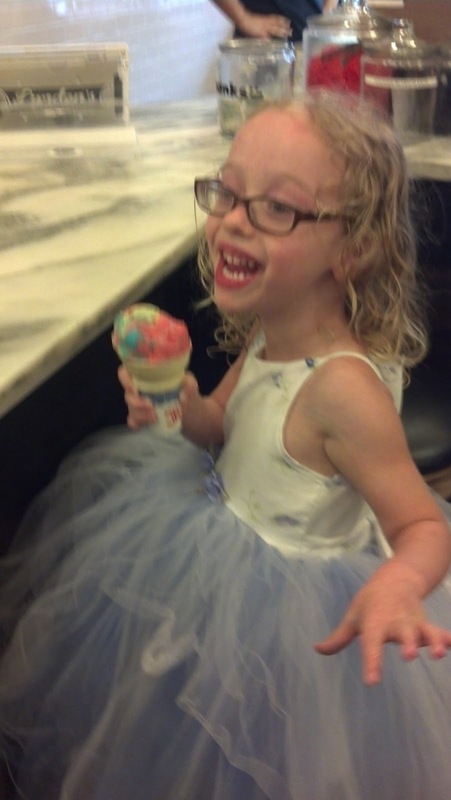 This year she helped to pick out a Dairy Queen cake, and she was pretty excited to learn that ice cream and cake can be integrated. When we offered her an ice cream cake she thought we were joking ("ha ha, nooooo that's silly" is what we heard). So happy Grandpa and Grandma Russell made it to the party! Clearly she already loves the gator she received from them for her birthday. This gator fits in her hands, and Grandpa Distad suggested she bring it to his house for a ride in her other gator! Sounds like a good idea. Family photo! I promise Charlotte was happier in the photos taken prior to this. I think she smiled in the first photo, but I later realized it was taken with Grandma's identical camera. Charlotte kindly giving the turtle to Molly in the pool. Charlotte was very kind, and Molly impressed everyone with her water skills. ...she can do this! What a trickster. She had a great birthday! Thanks to everyone who helped to make this day special (including the Home Depot cashier who gave her a Reece's Peanut Butter cup - random act of kindess). In the photo above she is waving goodbye to Grandma and Grandpa. She spent last weekend with Grandma and Grandpa Russell in Eau Claire. She was gone for TWO WHOLE NIGHTS, the longest she has ever been away from both of us and we missed her very much. Not sure she missed us as much, she had a great time and assured us that she would like to go again (we also had fun painting her sand box and biking to St. Paul for lunch sans Charlotte's trailer, thanks Grandma and Grandpa!). One of the many fun things Charlotte enjoyed in Eau Claire was Chalk Fest where she got her very own sidewalk square. 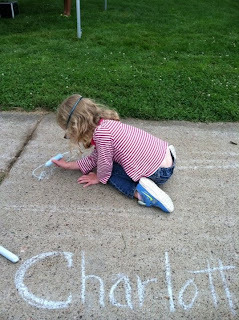 At Chalk Fest she learned she can change the shade of a chalk color by getting the chalk stick wet - she likes to teach us what she learns. Unfortunately she spiked a fever during her last day with Grandma and Grandpa and came home feeling pretty sick. Fortunately the illness was short-lived and she was better by Monday evening. In late July we enjoyed a hayride with the Amundson family! Look at that beautiful corn field. Today in the grocery store Charlotte identified corn on the cob and remembered that my cousin Marty and his wife, Kelly, grow corn at their house. Let this be another marker of how much she has developed this year - her memory and ability to make connections is quite impressive. After the hay ride we went to the Olmstead County Fair with Grandma and Grandpa Distad. Charlotte got to ride her first horse! And milked a cow, albeit a plastic one. She pet a duckling! The props for her beautifully braided hair go to my cousin-in-law, Kelly. I hope Charlotte let's me continue to practice my braiding skills. Charlotte was very excited about the tractors. Perhaps she would do well in a rural setting someday! Just a few days prior to the hay ride and fair we traveled to Duluth for the Tall Ships event. If you look really closely you can see Charlotte sitting on the wall next to Grandma Russell holding a black umbrella. This is a pretty popular event. Patrick forgot his own sun hat, so he borrowed Charlotte's. Handsome, isn't it? Waiting for the ships to parade into the harbor. Here we are post-parade in the museum. Charlotte always enjoys stopping to read a book. The weather on Day 1 of Tall Ships was perfect. Day 2, not so much. 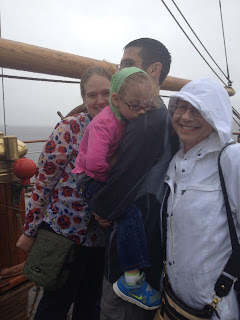 While standing in a long line to walk through the sail boat from Norway it started to rain, inclement weather for which we were unprepared. I don't know that I have ever been so wet. Most of us managed a smile for the above photo, but Charlotte was done. She and I soon made an early exit and she ended up getting her first Duluth sweatshirt (yay for dry clothes!). The final group of photos below were taken at Itasca State Park. Each year the college I work for takes first-year students to the Itasca Biological Station where they learn biology, get to know each other, and begin their college transition. In addition to learning about science myself I get to enjoy the park with my family. Here is Charlotte lounging in the Mississippi Headwaters. She wedged herself between the rocks so thoroughly that she managed to get a leech on her foot. I haven't heard of others getting leeches from the headwaters. Thank goodness Dad was with us to assist with the removal of that creature. Gross. Charlotte and I biked back to the headwaters just before we left the park and she ran across the Mississippi river. And posed for the traditional headwaters photo. We were fortunate to be the only people at the headwaters for about 5 minutes on the morning these photos were taken. It was incredible! While at the park we spent some time at the beach. Patrick taught Charlotte how to build sandcastles. 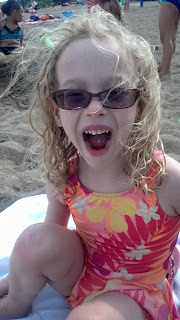 Charlotte was thrilled to find a real shell on the beach. She has been looking for shells in the sandbox at school despite being advised that she would most likely not find a shell in that location. Her persistence is admirable. 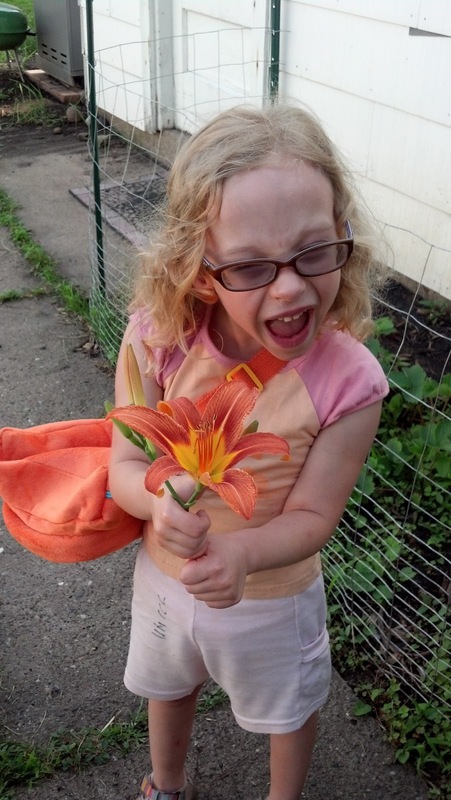 She was very excited to get a Nature of Life t-shirt and name tag. I love that the name tag hangs down her knees. Here is our traditional NOL family selfie to wrap up the blog photos. We had just gotten rained on during our walk back to our cabin (our weather unpreparedness is becoming a theme), explaining the drops on our shirts. August is looking to be a lower-key month than July. We plan to take in the State Fair and otherwise hang around home to enjoy the summer weather. Patrick and I are both getting increasingly busy at work with fall semester just around the corner. If there is a lapse in the blog, that is the reason. All the best to you and yours! This evening Charlotte donned a celebratory dress and enjoyed a Superman ice cream cone at the neighborhood ice cream parlor to commemorate her first real BM in the toilet! She has gone BM before but only after we notice it is already happening and throw her on the toilet. Tonight she surprised us and just did it! It was about a year go when she had her "first" BM in the toilet, but we hope that this time it is for real! Celebratory ice cream was a sweet way to wrap up a wonderful long weekend. We started our weekend with a Fourth of July Parade in Edina, MN. Here is Charlotte waiting for the parade to start. We arrived 1.5 hours before the parade start time and were able to squeeze our chairs into the last available spot along the street. Turns out experienced Edina parade goers put their chairs out the night before - yikes! We better step up our game next year. We then enjoyed a lovely lunch with Patrick's family, including part of the Alaska contingency: Megan, Al, and baby Aubrey. There were some cute photos taken that are currently posted to Facebook. Following that fun we took Charlotte home to swim in her pool with some friends before her first fireworks! We watched from a parking ramp without the greatest view, but she mostly enjoyed riding her scooter around on the pavement. She spent much of the weekend in her pool, and actually spent all of Friday in her swimming suit. 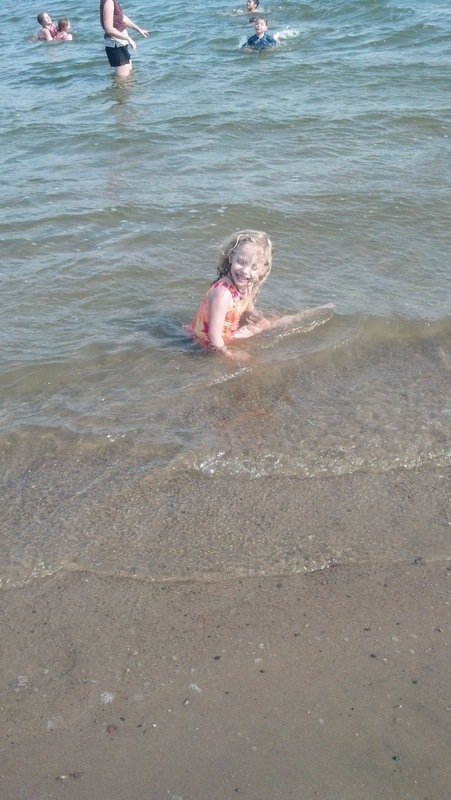 In addition to playing in the pool on Friday I took her to the beach at Lake Nokomis. 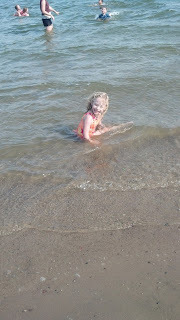 Here she is loving the beach! And the water, too! Her feeding tube was removed last July, so it has still been less than a year. This means that last year I would not have been able to take her to the lake as there was increased risk of infection from lake water around the tube site. We are all happy the tube is gone. In order to keep the weekend of fun rolling through Saturday Patrick ran the 25K Afton Trail Race and we visited Como Park with Aunt Kelly and Molly. Charlotte walked a grand total of 2 miles to watch Patrick's race. We rarely go sans stroller, but I only brought our umbrella stroller and it would not have been helpful on the trails. She was quite the trooper but was happy to stop for a photo as we walked over a creek. Drawing in the sand while waiting to give Daddy his bottle. Go Patrick! I like this photo because Patrick is looking to me for his water bottle but Charlotte is a bit closer to the ground with an outstretched arm (not photoed). It turned out Patrick had to turn around and reach backward to get his water bottle (Charlotte will work on her crewing skills), but everyone in the crowd talked about what a great dad he is. True, all true. Though I think they missed that it was mom who coaxed Charlotte to walk 2 miles. Patrick ran a great race, finishing in a respectable time for third place. It was hist first race of the season, so it was nice to see him running again. After a quick nap for Charlotte and Patrick we were off to Como Zoo! Patrick may be mid-blink or else he is making eyes at the Giraffes. Regardless, it is a cute picture. If you ask Charlotte about the zoo she will first tell you that we didn't see the Polar Bears. They must have been hiding out in the back of their exhibit. We did see the new gorilla exhibit, and Charlotte gave us a great gorilla impression for her photo with her new gorilla friends. Our trip to the zoo ended with a traditional ride on the carousel. Well, I'm tired just summarizing our weekend for the blog post, but wait, that's not all! 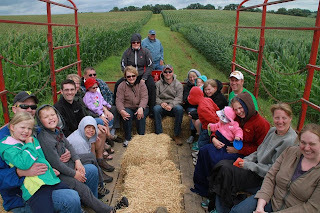 Today Grandma and Grandpa Distad visited from Kasson. We visited Minnehaha Falls to take in the rushing rapids after a very rainy spring. Charlotte did some rock climbing along the creek. And Patrick bravely stood in the rushing waters with Charlotte. Thanks to Grandma for taking a rare photo of the 3 of us! Prior to this weekend we've been up to other fun things as well! 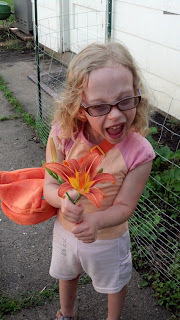 Charlotte gets excited with every new flower that blooms in our yard. We are so appreciative that a gardener previously owned our home. The flower gardens are beautiful. We celebrated Father's Day at a petting zoo in Chippewa Falls, WI. Charlotte is starting to pick up on family associations. Today she was asking me if Grandma and Grandpa Distad were my mommy and daddy. And him! Look at that awesome dad pushing the Merry Go Round. Whew! Time to prepare for a Monday full of work (Patrick and Katie) and school (Charlotte). She has big news to tell her teachers! They will fully share our excitement for what is potentially a corner turned in our toilet training saga.